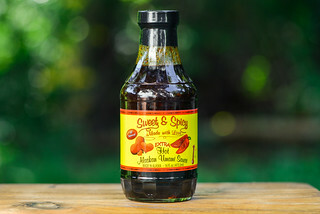 Relying too heavily on sugar is this sauce's downfall, whose redemptive vinegar and spice gets drowned out completely by sweetness after being cooked. A couple years back I got a shipment of six sauces under the Garland Jack name and it took me nearly that long to give them all their own review. It appears around the time I posted my last Garland Jack review, the brand was pulled from the market and my blog seems to have taken on a life as a support center for distraught loyalists. 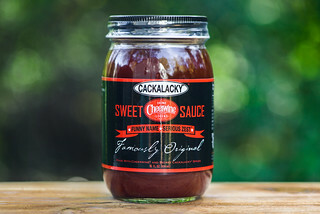 Garland Jack was a sub-brand of the food giant Kraft, and once Garland Jack disappeared recently, Kraft revamped their main sauce line with ingredient lists that match Garland Jack's exactly. 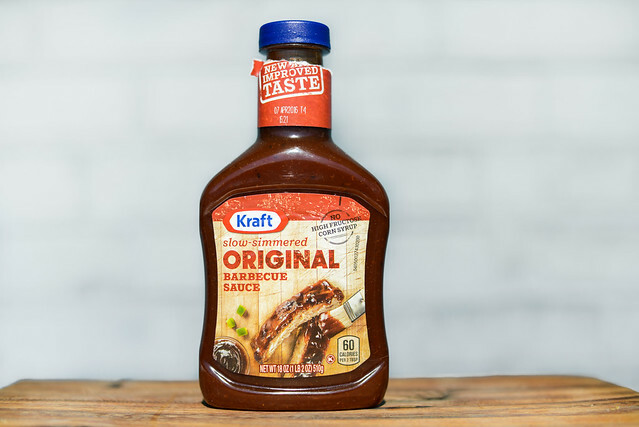 I never heard anything great about Kraft barbecue sauce previously, so pretty much avoided it, but now I was intrigued—was Kraft the same as the decent Garland Jack, giving hope for those seriously missing their beloved sauce? I picked up a bottle to find out for myself. 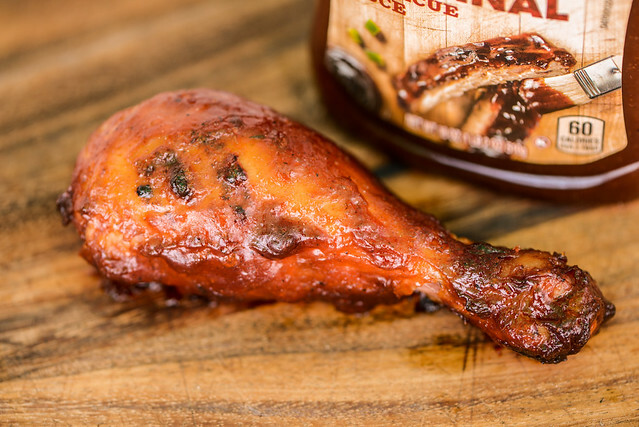 Liquid smoke combines with vinegar to give a smoky and tart first impression. There's a strong sugary base that mixes with the tomato lingering right behind it to create a ketchup-like aroma. The sweetness gains depth thanks to a nice dose of molasses. The spices struggle to come out, but there's faint onion and garlic notes, but no discernible heat. 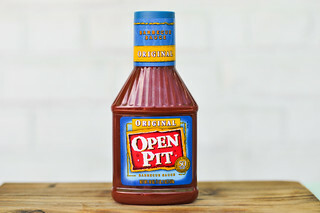 This smooth, rusty red sauce has a glossy sheen that glistens in the sun. It weighs it well north of medium on the thickness scale. It's so viscous that most of the sauce remains clinging to a suspended spoon after gravity has caused one or two globs of sauce to release from the silverware. Since the sauce is opaque, it's hard to pin point the spices, but a fair amount of white and occasional black specs can be seen on the surface. A spoonful of sugar greats you on first taste of the sauce. 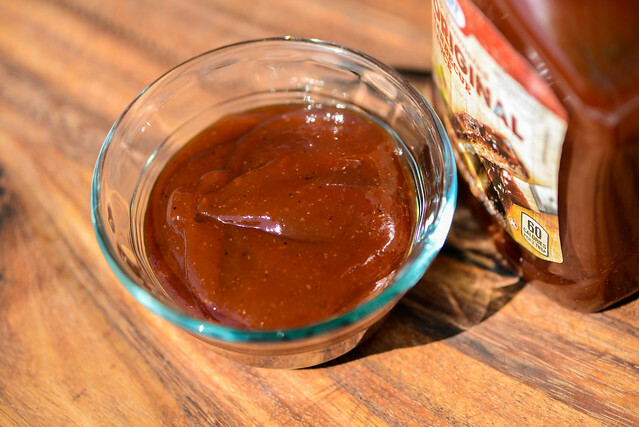 The intense sweetness quickly combines with the tomato and molasses to give it depth, tasting like a more complex ketchup. It's only after the sauce has sat on the tongue for several seconds does the vinegar add a contrasting tang to bring in a sense of balance. Right after the sauce gets its tartness, the spices start to make an appearance by way of onion and garlic first, then pepper that creates a mellow heat at the finish, which still has a notably strong sweetness. The sauce coated the chicken in a thick, uneven layer that failed to bake in well over indirect heat. When I moved the leg over to direct heat, there was some burn off first and then minimal caramelization because a lot of the sauce was now gone—I applied an extra brushing to ensure there was enough for testing. After being cooked, the little balance and depth from vinegar and spices was pretty much absent. There was some light oniony notes, but the overall flavor was sweet and ketchup-like. So now for the moment of truth, is this in fact the same as Garland Jack? I would say it's pretty damn similar. As I look back at my Garland Jack review, I wonder if I was being generous that day, or if memory escapes me because right now, I wouldn't deem this sauce as a perfectly middle of the road. Overall, it has a processed flavor that starts to veer toward unnatural. The heavy reliance on sugar tips the balance way too much to the sweet side, but vinegar, spice, and smoke do help that out in the end. Unfortunately those redemptive characteristics fade after being cook, leaving the sauce pretty much all sticky sugar. I certainly have had much worse sauces, and for the money, this new and improved Kraft Original isn't that bad, but I'd personally spend the little extra for even a slight bump in quality to make my meats taste fresher and more balanced than this Kraft can deliver.